Welcome to the first Chemicals Management Software Guide brought to you by Chemical Watch and Chemical Risk Manager. This guide is designed to help you understand the software that supports regulatory compliance and also enables businesses to move beyond compliance and achieve safer chemicals in products and throughout the supply chain. What’s inside the Chemicals Management Software Guide? 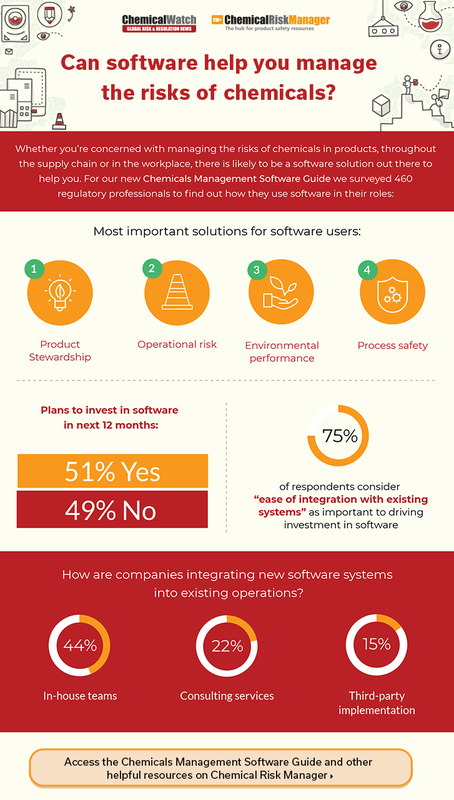 Analysis of our chemicals management software user survey results. Automated systems are now available to enable companies to mitigate operational risks. Multiple vendors offer software systems to manage environmental performance but users must choose carefully to ensure that their needs are met. Software is now available that enables users to carry out their own occupational exposure and hazard assessment. How can product stewardship software help companies cope with the increasing demands placed on them by chemicals regulations? Effective software programmes can enhance process safety performance and in turn offer many business benefits. Sphera is the largest global provider of operational excellence software and information services with a focus on environmental health & safety (EH&S), operational risk and product stewardship. Chemical Watch publishes news and intelligence to help companies meet responsibilities under chemicals legislation worldwide, including regimes such as REACH, CLP, GHS and TSCA. We keep you abreast of policy and business trends across Europe, North America, Asia and the rest of the world. Chemical Risk Manager is designed specifically to support professionals managing risks of chemicals in the workplace, through the supply chain, and in products, by delivering essential news and resources to help you with your practical challenges.